Protect your family’s best friend with the Sentry HC WormX Plus 7 Way Medium & Large Dog De-Wormer. This broad spectrum de-wormer works to keep your tail-wagging pal clear of tapeworms, roundworms and hookworms with veterinary-grade ingredients―and no prescription needed. It works to eliminate seven types of worms for a more complete treatment, and can be used to treat current infestations or to prevent new ones, especially for dogs that might be prone to catching them. Plus, it comes in a tasty, chewable tablet that’s easy to give and offers 30 days of protection for your pal. 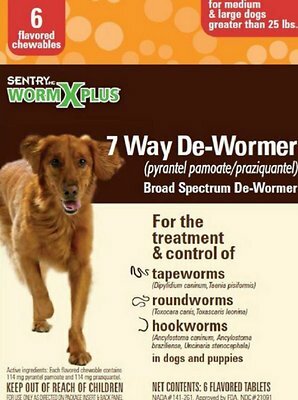 Treats seven strains of worms, including tapeworms, roundworms and hookworms. Works on current infestations and also helps prevent new ones for prone pups. Convenient chewable, tasty tablet that’s easy to give even for picky dogs. Contains veterinary-grade active ingredients without the need for a prescription. For use on medium and large dogs weighing greater than 25 pounds. For the removal of large roundworms, hookworms and tapeworms in adult dogs or young dogs, weighing more than 25 lbs., administer these tablets according to the weight of the animal. Weight determines number of tablets given to dog. Most dewormers involve following your dog for 24 hrs to avoid accidents because they cause bad tummies. This one did not do that, my dogs ate like normal and were on their normal schedule it was great! No worms, no headaches. And Chewy was 1/2 the price compared to my local chain pet store. Recently purchased the dog dewormer, for the first time, a few weeks ago. The directions are extremely vague. It tells you how many tablets to feed per weight but doesn’t say anything about it being a one time dose or multiple doses needed for full effect. If I could give a -1 star I would. Chewable?? Very hard round tablet my dog could not chew could not even cut with a knife would not even dissolve in water. Waste of my money! After using RFD dewormer on our 5 dogs, it was proven not to be working. The dogs still had roundworms. Switched to Sentry product ordered here. After one dose each, all eggs, larvae and mature worms were killed. Chewy also has extremely fast free shipping. Both dogs gobbled them up, easy to order and seems to work. Both my dogs get unusually hyper a couple times a year. When we deworm them, they settle back down. The only difficultly I had was with Fed ex. But Chewy helped me with them as well. I like this product I gave the first dose to my dog and she was fine after that I recommend to anyone great product. I was shopping around for a good wormer that didn't cost a lot for large dogs, and was also safe for puppies. This product definitely delivered. Other wormers would've costed much more for the size dogs I have, and to have a script from a vet would be even more so. I was able to worm my 90, 50 and 30 lbs dogs and still have two tablets left over. I noticed large worms pass in my puppies stool and he has immediately improved condition and gained weight. Shipping was free and timely. This works for my heeler who likes to eat "poo". The monthly heartworm doesn't take care of the extra "stuff" she consumes in the pasture. I like that it's a tablet. I asked my vet if this would take care of the problem and she said it would. My dog had no side effects. Worked fast and no more signs of worms.